Update: As of 06 November 2018, the Thai government has waived the visa fee of 2,000 baht to increase tourism in the country. Thailand is the mecca of Indian youngsters looking to go abroad and have a good time. It’s close to India, cheap and an incredibly fun place to be! One can enjoy an awesome holiday in Thailand at an affordable price. The best part about visiting Thailand is that it’s just as easy as travelling to another city in India. Thailand offers Visa on Arrival for Indian tourists. The visa process is very fast and takes just 1-hour maximum. So, let us first read about what is Thailand Visa on Arrival for Indian tourists. What is Thailand Visa on Arrival for Indian tourists? 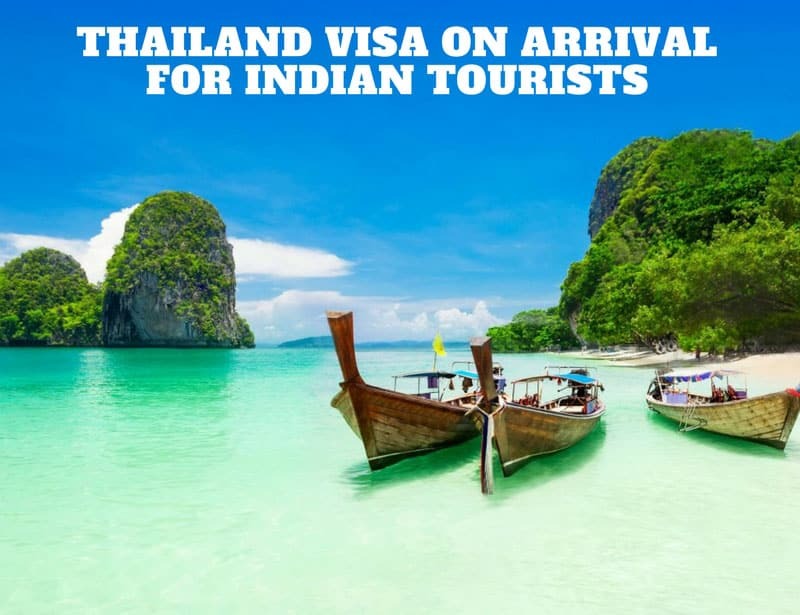 How to get Thailand Visa On Arrival for Indian tourists? Let’s say you are arriving at one of the designated Visa on Arrival points in Thailand mentioned above. You’d be required to fill up the Thailand visa form and submit it at the immigration counter. Your passport must be valid for at least 6 months from the time of application of Thailand visa. Also, make sure that your passport contains two blank page so that it can be stamped when entering and exiting Thailand when your Thai visa is granted. Please bear in mind that the Immigration officer has the final say on granting your visa. So be in your best behaviour and equipped with all the necessary documents. The Visa on Arrival application fee is 2000 Baht per person (about Rs 4220 at today’s Thai baht exchange rate in India), which has to be paid in Baht currency only. Depending on the number of tourists applying for Visa on Arrival, the process could take from 10 minutes to an hour. Return flight ticket within 15 days of entry to Thailand. Please note, travelling by land out of Thailand, by bus or train, to Cambodia, Laos, Malaysia, Myanmar, etc is not accepted as proof of exiting Thailand. A Passport which is valid for at least 6 months from the time of application of Thailand Visa. Visa Application form filled and completed. 2 Passport size color photographs taken within 3 months with white background. Proof of means of living expenses while in Thailand. That is 10,000 Baht per person and 20,000 Baht per family. This could be in the form of cash and/or forex card. The maximum amount of time you can spend with your Visa on Arrival is 15 days in Thailand. Tourists using Visa on Arrival facility cannot file an application for extension for a stay in Thailand. An extension is only possible under special circumstances such as an illness which prevents you from travelling. It’s really very simple getting a Thai Visa on Arrival. Simply fill up the form, submit necessary documents at the Thai immigration counter, get set and go!